Come and join us for an evening of Festive Fun and Entertainment at Whitechapel Church, Cleckheaton. As this special anniversary year comes to a close we’d like to thank you all for your support and wish you all a “Merry Little Christmas”. Come and join us for our annual Christmas Celebration on Thursday 14th December. A free event for all the family. This year the band turns 40 and we’d like to celebrate by getting as many ex members of the band back for a special reunion concert. If you played in the band and would like to recreate the excitement of being on stage then let us know. Fill out the form and join us for what promises to be a great evening of entertainment, great laughs and rekindled friendships. Don’t worry if you’re rusty, we plan to hold some rehearsals beforehand and the current band will also be playing alongside you. If you’re interested then leave us your details on this form. Once again we will be holding our annual Christmas Celebration, why not come along for an evening of free entertainment and festive fun. Join us once again as we celebrate Christmas at Whitechapel Church, Cleckheaton. An evening of festive fun and entertainment for all the family. 2015 is starting to look like another busy year. 2015 is looking like another busy year for the band with bookings in the diary already for a events in December! Family and friends are invited to join us for our Race Night on Saturday 7th March at Whitcliffe Mount. A fun fund raiser for the band and open to everyone for an opportunity for fun, excitement and a chance to win big! Band members will then be competing individually at the TYMBA solos’s event on Sunday 22nd March and pitting themselves against other individual players to fight it out for a chance to perform in the TYMBA Musician of the Year final. The first event will be a joint concert and coffee morning with Cleckheaton Music Centre on Saturday 28th March. Full details will be released later but the band are looking forward to playing alongside Cleckheaton Music Centre once more. Moving on to April will see the band playing at the Harrogate International Festival once more. There is also the annual St George’s Day Parade at the end of April. For more information about what the band is up to then look at our events page. This year once again the band will be celebrating Christmas at Whitechapel Church, Cleckheaton. It promises to be a fun festive evening to get you all into the Christmas spirit. 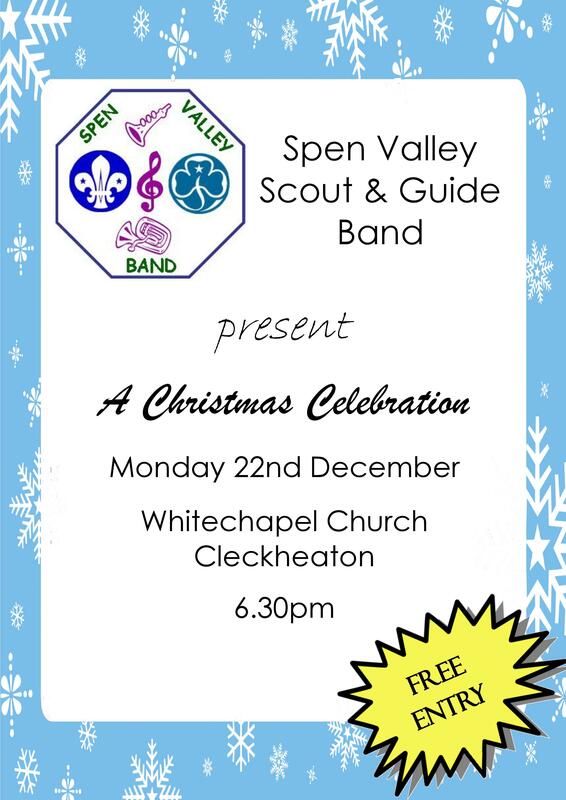 Entry is free, come along and start your Christmas celebrations with Spen Valley Scout & Guide Band. 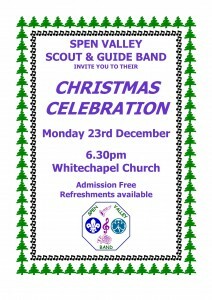 Spen Valley Scout & Guide band will be bringing the Christmas spirit to Cleckheaton on Monday 23rd December for their 2nd annual Christmas Celebration concert at Whitechapel Church. 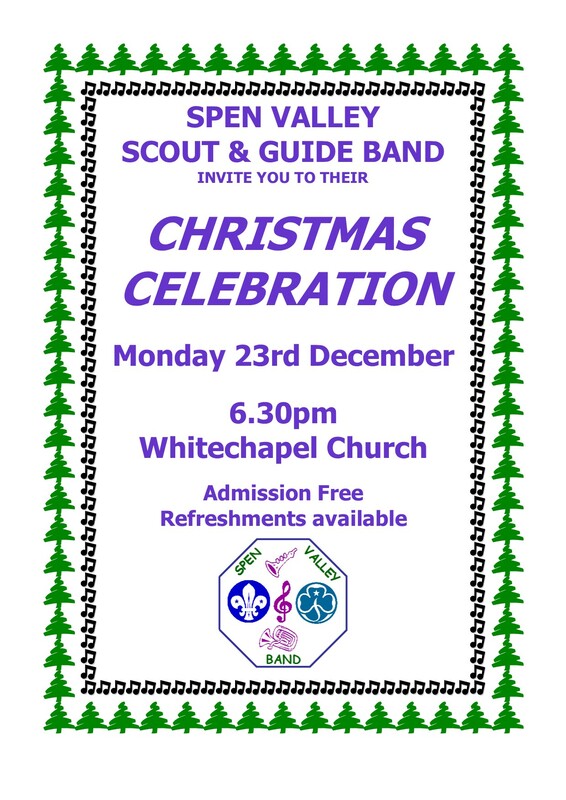 All are welcome for an free evening of festive fun, just don’t forget your singing voices. 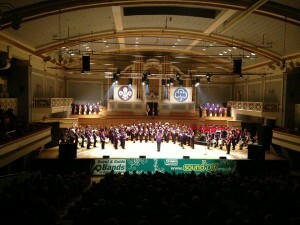 On Saturday 21st September members of the Spen Valley Scout & Guide band joined forces with the Scout bands from Leicestershire to perform in Sound Off 2 at the DeMontfort Hall, Leicester. Well what a show, what an Audience and what an experience for all those band members who took part. I’m sure the audience reaction will live with people for a very long time. We’d like to thank the members of Leicestershire County Scouts for inviting us to come along and perform and also congratulate them on putting on such an amazing show, the below link is the write up following the event.